Because I don’t know exactly what a “ewer” is, but I know I don’t have one. Given that I had no idea things called ewers existed, I’m not sure exactly how I managed to find this one, from Etsy seller chrysbonnaylewis. I’m glad I did, though, because I kind of love it; it will definitely help alleviate my severe shortage of breast-shaped vessels. 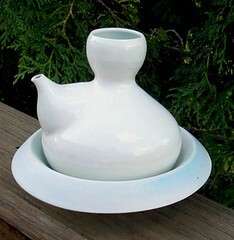 It looks like a fancy neti pot.